A collection of available blazers at Wolfpack Styled, a career clothing resource on campus. Through the Wolfpack Styled clothing reuse program, NC State’s Career Development Center connects students with free professional clothes while also reducing textile waste. For most college students, there comes a time to trade the casual clothes of the classroom for a career-ready, professional wardrobe. But tight budgets, lack of transportation and busy schedules juggling multiple jobs can put shopping for professional clothes out of reach for some students. That’s why NC State’s Career Development Center offers Wolfpack Styled, an on-campus clothing resource through which students can acquire quality and free professional clothing that has been donated. Tucked in room 2100 of Pullen Hall, Wolfpack Styled is conveniently located in the Career Development Center so that students can shop without leaving campus. Available items include both men’s and women’s styles that are seasonally-appropriate, in excellent condition and organized by size. In 2016 alone, more than 480 students utilized Wolfpack Styled, particularly in advance of major career fairs on campus. “We’ve had people waiting in the lobby it was so popular,” Laraway said. In addition to boosting student affordability, Wolfpack Styled reduces textile waste. Instead of discarded items going to landfills or being recycled, these blazers, skirts, button-down shirts, shoes and other items gain new life through reuse. Wolfpack Styled is open about 9 hours each week for students to browse and try on clothes. Student interns and volunteers organize and sort donations, which have come from faculty, staff, alumni and new retirees. A local, alumni-owned consignment store also consistently contributes its overstock supplies of professional clothes. Laraway estimates Wolfpack Styled has served hundreds of students since 2012 when an Americorps volunteer working the Career Development Center developed the concept of a professional clothing resource for low-income students who might not be able to afford the cost of building a professional wardrobe. The pilot program’s success convinced Laraway that the effort met an important need for career-bound students. 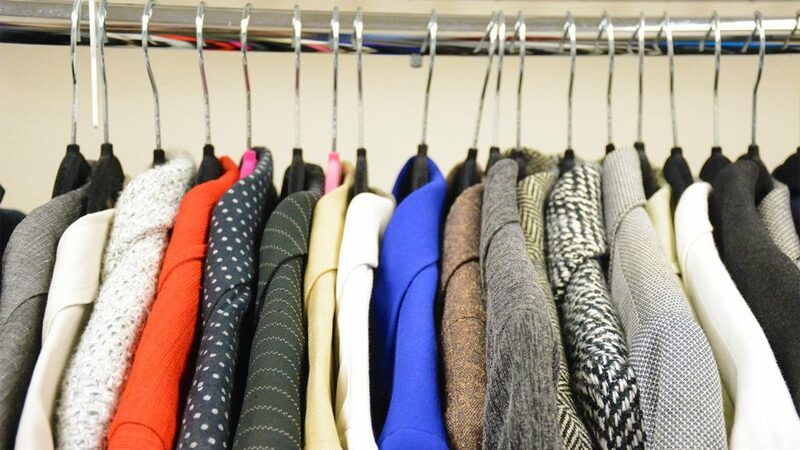 After Laraway began receiving calls from NC State alumni who wanted to donate professional clothes, she emptied a storage room in the Career Development Center and used a small grant from the NC State Parent’s Fund to purchase clothing and storage racks that display donations and make student shopping easier. Donations to Wolfpack Styled are eligible as tax-deductible gifts and accepted at the Career Development Center from 8 am to 5 pm weekdays. Most needed items include men’s clothes and timeless, essential items that students can use for years to come. To donate or learn more, visit Wolfpack Styled on Facebook. Published in News, Newswire, Uncategorized, Waste Reduction.